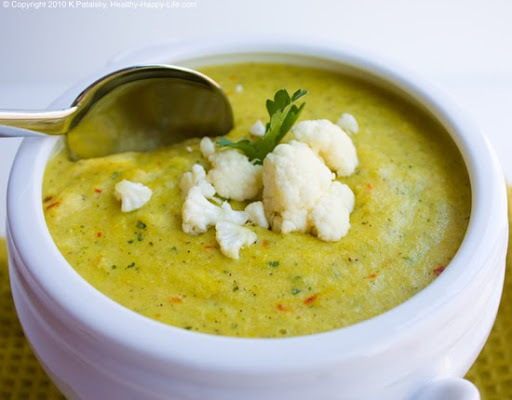 Creamy Herbed Cauliflower Soup. Organic. Vegan. 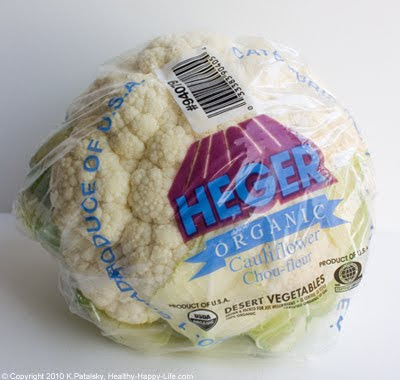 Organic Cauliflower. 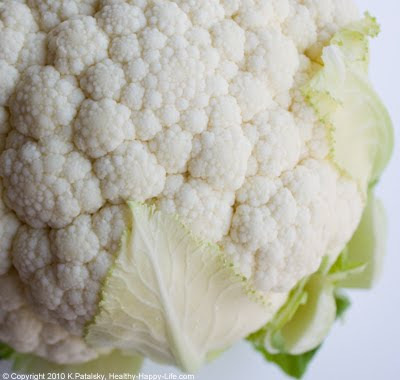 I'll admit that I often avoid buying cauliflower simply because it looks a tad intimidating. Giant. White. Lumpy. Hard. And sometimes I talk myself out of buying it by saying: "well if I'm buying a cruciferous floret-containing veggie - I'll just buy broccoli. 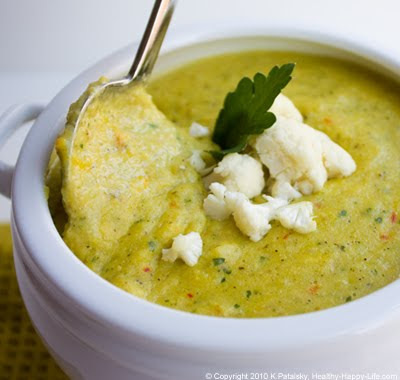 It's healthy green and easy." 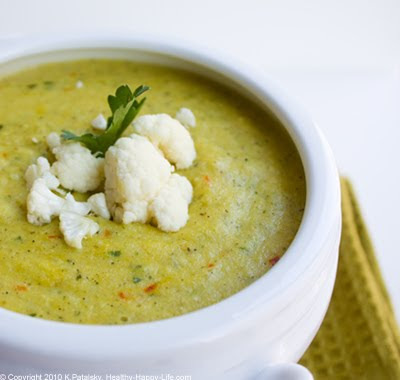 But when I saw this fresh, beautiful organic cauliflower on sale at Whole Foods, I decided to give in and make a creamy cauliflower soup - a perfect dinner on a chilly night. 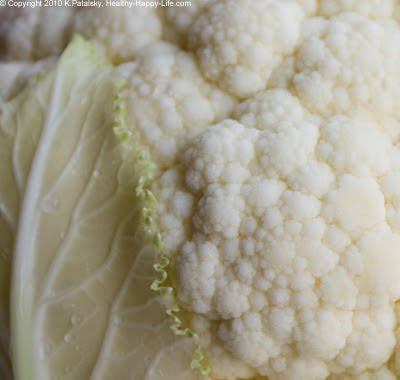 "Cauliflower and other cruciferous vegetables, such as broccoli, cabbage, and kale, contain compounds that may help prevent cancer. These compounds appear to stop enzymes from activating cancer-causing agents in the body, and they increase the activity of enzymes that disable and eliminate carcinogens." 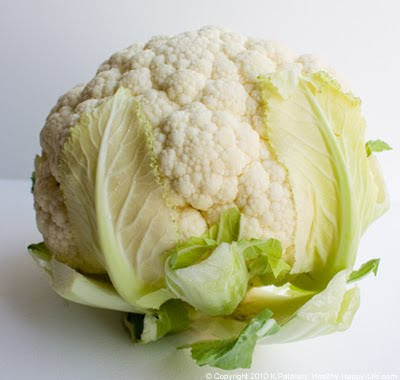 They also comment that cauliflower may assist in the detoxification process. 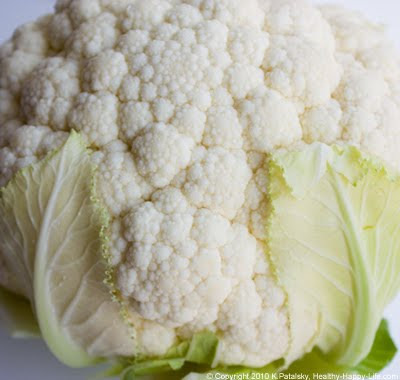 Read more about cauliflower's health benefits on WHFoods. 1. Place large soup pot on stove over med-high heat. Add EVOO. 2. Add chopped onion and saute for a minute. 3. Add in chopped potato. 4. Turn up heat and add in ACV, veggie broth, soy milk and chopped cauliflower. Add cauliflower in broken crumbled pieces. Cover with lid or foil and allow soup to 'steam cook' cauliflower for about 4 minutes. 5. 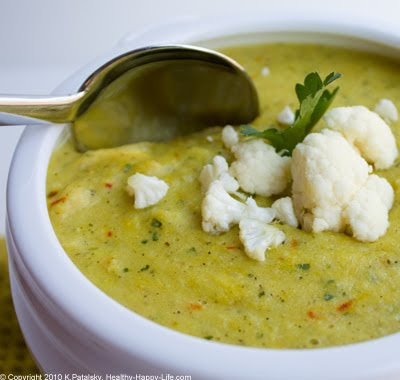 When cauliflower and potatoes are tender, add in your dried herbs, pepper, mustard and maple syrup. Fold these items into the soup - let cook for another minute. 6. Turn off heat and remove pot from stove. Transfer soup to a large mixing bowl to cool for a few minutes. 7. While soup mixture is cooling, turn stove back on. Place your soup pot back on medium heat. Add your roux liquids and whisk in the liquid bit by bit. Try not to create clumps. When all the flour has dissolved into liquid to form a thick liquid, add in the saffron strands. Turn off heat, and set aside. 8. Carefully transfer soup mixture to a high speed blender - blend in batches - not all at once. I blended the soup in three separate batches. 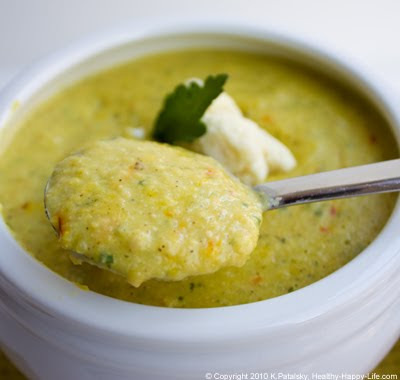 NOTE: You will add the parsley and optional nuts/seeds directly to the blender to blend with the soup. 9. In the last batch of soup you blend, add the roux. Then combine all the blended soup and fold gently. 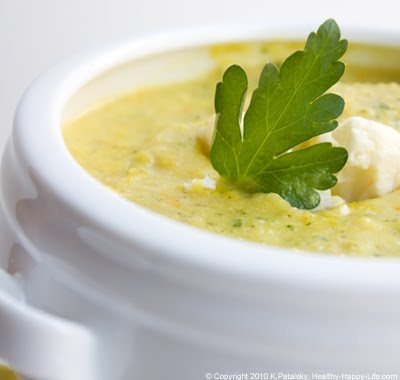 Eat at once, store in the fridge or pour soup back into soup pot to simmer until ready to serve. Note: When re-heating, you may want to add a bit more soy milk or veggie broth to thin out the soup.